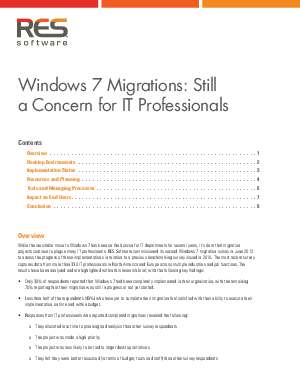 While the inevitable move to Windows 7 has been on the horizon for IT departments for several years, it’s clear that migration projects continue to plague many IT professionals. RES Software commissioned its second Windows 7 migration survey in June 2012 to assess the progress of these implementations in relation to a previous benchmarking survey issued in 2010. The most recent survey captures data from more than 330 IT professionals in North America and Europe across multiple industries and job functions. The results have been analyzed and are highlighted within this research brief.